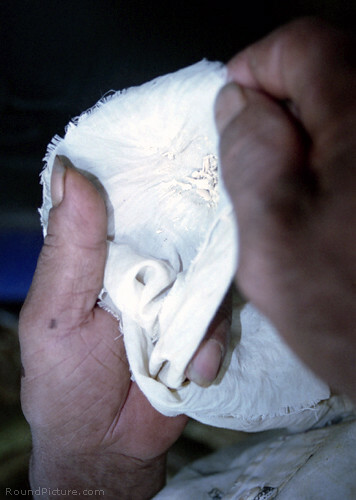 Much of the world’s cocaine is produced in Colombia. 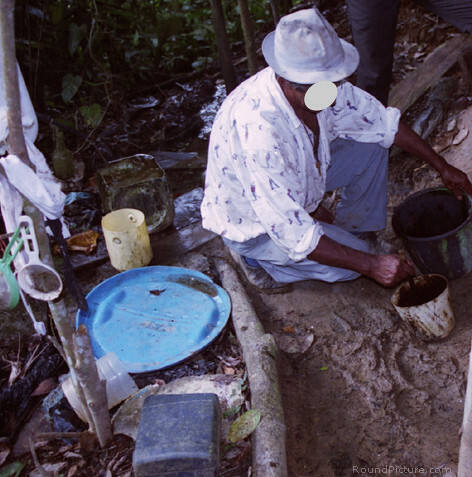 In its jungle in the north, I had an opportunity to visit a working cocaine laboratory, and get an insight into production of cocaine, and to a larger degree, its trade. Towards the end of my La Ciudad Perdida trek, the guide asked for 20,000 Colombian pesos from each of us who agreed to go on a side tour of a cocaine laboratory. The money would have been split between him and the man who runs the cocaine laboratory. The cocaine lab man led us along a short trail through the jungle starting at the back of his house, which was just down below from our campsite. The lab was nothing like I had imagined it to be. There was nothing high-tech or even hygienic about it. It was a rudimentary setup of an open space about the size of a volleyball court with a plastic cover over it. There were coca leaves drying on the cement floor section, and the other sections of bare muddy grounds were used for production and storage of gasoline and other chemicals. 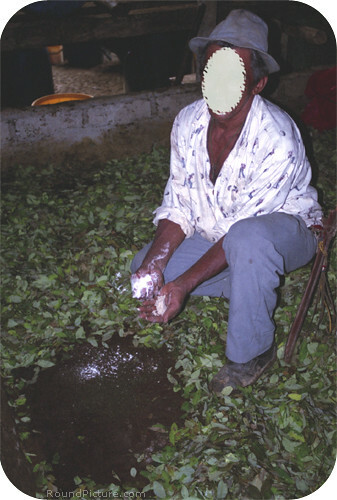 The man demonstrated each step of cocaine production process. He didn’t mind us taking pictures of him or the facilities, but I disguised his face in my pictures just in case. First, he added salt to coca leaves. They were then soaked in gasoline – a large quantity of gasoline is used for cocaine production. After the mixture was drained, more chemicals were used in subsequent steps. Finally, you ended up with filtered white cocaine base. The man sold cocaine to paramilitary groups controlling the area for about 2,500,000 pesos/kg (USD 1,000-1,400/kg), then the paramilitary groups sold it on for about 30,000,000 pesos/kg (USD 12,000-17,000/kg) [to drug cartels, etc.]. 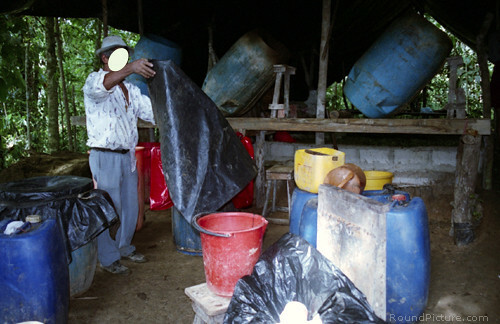 The man acknowledged the dangers (and greater income) involved in cocaine production and dealing with the paramilitary groups, but he didn’t seem at all concerned about the end users or greater drug related issues. To a degree, in the circumstances he was in, he was just like any other farmer trying to make a living. why dont u tell us the exact steps, weights of substances used ? would you plz. mention the exact amounts of substances used in the production process? and the systematic steps? plz. Didn’t u see something else more interesting than this?? Do u know that is bc people like u that we have this image?? If u are so iterested in drugs, why don’t u go to Mexico and see how u get killed by their assassins? I am from Colombia and I can assure you that you were taken for the money, they see suckers like you everyday just as the suckers on here who want to know how to make it. You would not see a drug lab and live let alone take pictures of a guy making cocaine. It has never crossed my mind but that is a possibility. I’m not a drug user nor have any expert knowledge on the subject so I cannot say it was a setup or not. But knowing what I know about the region and Colombia I am inclined to think it was a genuine cocaine lab. Either way, your comment will make people be more aware, so thanks. Very cool, It looks like the real deal, and it is Columbia not the US so im sure it was real. It’s cool to see someone who travels off the beaten path on their travels, it’s the only was to really dive in and experience the cultures of where you go. Couldn’t help to wonder if a free sample is included at the end of the tour lol. Nice job for showing the world something pretty cool, that not a lot of people will ever see in their lifetime. Tommy, its “COLOMBIA” not “Columbia” and how is it cool to see something that kills millions of people every year? Do you know that because Colombia is a poor country a lot of young people will kill and die just to get into it for the money and its not like the money you would get in the U.S. they receive very little money and its not all fame and fortune like the movies show you and its not a part of the Colombian culture either. And as I said before they weren’t at a real lab, they were taken for their money. Meth labs and crack labs are all over the U.S. and how many of those labs has anyone seen while on their holidays? Some people will believe anything!!! I am from madiison wi… and am now in medellin. No problems accessing anything if you ask. It’s funny I left a comment on here long time ago and see it is no longer there along with all the other comments that showed how stupid this whole thing was. As I said the last time, this guy thinks he went to a secret cocaine lab was suckered like so many tourists each and every year. My wife is from here and we spend a lot of time down in Colombia. Santa Marta being one of the places we spend a lot of time at. I know people here and I know how they do things. Suckers are born everyday and I guarantee this guy NEVER went to an actual cocaine lab and lived to tell about it.